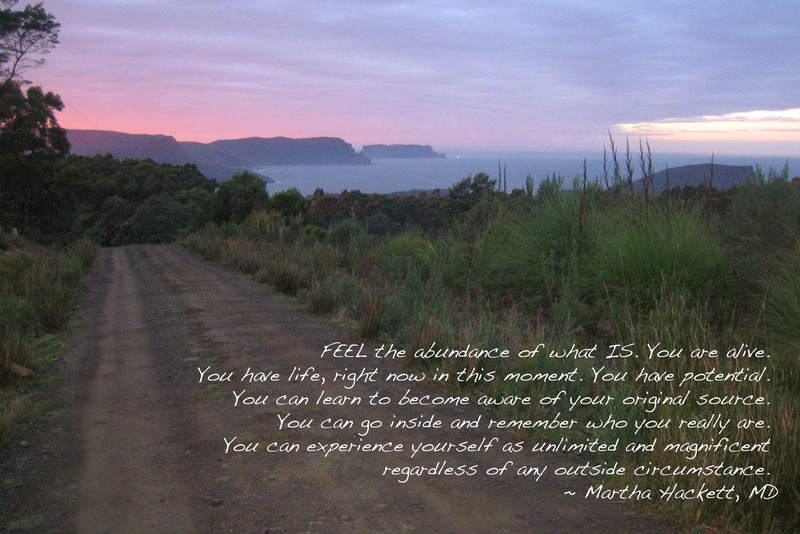 FEEL the abundance of what IS. Peace, joy, contentment. Financial freedom. Fulfilling relationships. Health. LOVE. Hold on. PAUSE. Breathe. Do it again. A good, big expanding breath and a relaxing exhalation. What is the feeling of right now? What really IS available right now? So the place is a little messy. Work has gotten a bit crazy. Kids take a lot of time. I can breathe. I can see. I can think. I have choices. Being mindful of and grateful for the present is great. Good job. But go in deeper, and FEEL the abundance of what IS. You are alive. You have life, right now in this moment. You have potential. You can learn to become aware of your original source. You can go inside and remember who you really are. You can experience yourself as unlimited and magnificent regardless of any outside circumstance. All that stuff you “NEED”… Impermanent, ever changing. The car can get wrecked, the job can evaporate, the house burn down, the loved one can die… God forbid, but possible. Who you really ARE is unaffected by gain or loss in the external world. Recall the stories you have read or heard about unbelievable people who kept their spirit intact despite all odds. Amazing. The human spirit. Abundant. Learning to experience yourself as just that spirit, pure energy, your original source, will help you KNOW the abundance that you ARE. No longer limited or defined by the props that we seek. You can feel that abundance in every moment regardless of the chaos around you. We came into this world as that pure energy. Visualize a newborn – they enter the world with nothing, no gear. Yet we bury our awareness of that energy through the domestication process of becoming a citizen of this earth and accepting the belief systems of our families, teachers, communities. We bury it so deep some people never reconnect with that original state of BEING. Quieting your mind though meditation can help reunite you with the true source of abundance within. This is where you will find the joy and peace that you seek. You ARE all that you long for. ABUNDANCE.